When it comes to choosing a long-term investment strategy, there are no guarantees of success with your first, second, or hundredth attempt. In fact, you’ll likely need to adjust your strategy over time as the markets change and you want to align your portfolio more closely with your ultimate investment goals. No matter what types of investments you flock to, many financial experts would agree that investing in dividend stocks and a dividend growth investing strategy are some of the best moves you can make if sustained dividend income is one of your major goals. There’s not one perfect way to invest in dividends, of course. Some investors choose to invest in companies that pay out dividends consistently or companies that offer significantly higher dividend cash payouts than others in the same industry (even if those dividends remain relatively stagnant each year). Meanwhile, some investors focus on dividend growth investing strategy by choosing companies that are more likely to increase their dividend payouts over time. This happens as the company grows and becomes more efficient, which then leads to higher levels of profitability. Which dividend investing strategy is right for your portfolio? That depends on whether you want consistent payouts now or higher payouts later on. Dividend growth investing differs from other types of dividend investing because you’re not necessarily looking for dividend stocks with the highest payout or the longest dividend history but rather companies with the greatest probability and willingness of increasing their dividend payouts drastically over time. Accounting for dividend yields is important because you shouldn’t just look at how much you could be earning in dividends each year; you need to focus on how much those dividend payouts are growing year-after-year. For instance, an established company like Exxon Mobil (XOM) or Procter & Gamble (PG) will have higher dividend yields and higher dividend payout ratio (percentage of net income paid out to shareholders in dividends) than a smaller, but fast-growing company. 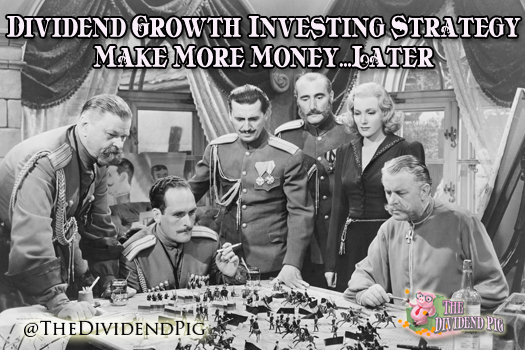 If you opt for a dividend growth investment strategy, then you are looking to invest in a company with a higher retention ratio (amount of company revenue not paid out to shareholders) because this means they’re using the extra funds to grow their operations and expand production, which can likely lead to larger, long-term gains for investors who got involved earlier on. Although it may seem unwise to invest in a company with lower dividend rates – especially without the guarantee that rapid dividend growth will lead to long-term profitability and higher returns for shareholders – this strategy requires considerable patience on the investor’s part. Companies like Coca-Cola (KO) and General Mills (GIS) are struggling to grow as quickly as they used to due to shifting consumer preferences and limited expansion potential, but they still manage to pay out good dividends to shareholders. Often, faster growing companies, have much more potential to expand and increase dividend payouts over the course of the next several years. By focusing inwardly on growing their sales figures, these companies are more likely to reward patient investors who are willing to wait for an eventual payoff (in the form of higher, consistently increasing dividends), while mature companies with slow or declining growth risk scaring off their shareholders by having to trim dividend payouts to align with sluggish or plummeting revenues. This is why dividends matter to all investors. Should You Adopt a Dividend Growth Investing Strategy? If you’re looking for quick returns and the largest dividend income stream right away, then a dividend growth investing strategy likely won’t work for you. However, if you’re willing to wait a few years for rapidly growing companies (or even older companies in a growth period) to work out their kinks, solidify their footing in the economy, expand their operations and become more profitable, then this long-term strategy just might be your ticket to higher returns and greater passive income stability. Here are some of my favorite dividend growth stocks (in no particular order) in my dividend portfolio. These companies have all averaged double digit dividend growth over the 5 years but still have plenty of room to run. *I would not necessarily purchase all these companies today at current values. If you looking for more information – here are some of the best dividend investing books. I absolutely agree that low yield, high growth dividend stocks are a sensible pick with a medium to long term horizon. If one doesn’t need the income for several years, the yield on cost of the high growth dividend stocks ramps up in a hurry. As my dividend portfolio grows, I’ll be transitioning more into the dividend growth names to ensure that the portfolio’s dividend growth easily outpaces inflation. Exactly Kody! I’ve done something similar. I’ve tried to balance dividend growth with some solid higher yielding companies. That’s one of the benefits of creating your own dividend portfolio – you can sprinkle in anything you want. Thank you for the comment!